In this Medivh Build Guide, we provide an overview of his strengths, abilities, talents and matchups. Medivh is unquestionably one of the most unique support heroes in Heroes of the Storm, and although labeled as Specialist, his kit offers a great deal of utility that benefits his team. Whether it’s his Raven Form providing vision and immunity, his Force of Will mitigating all damage or Portal for some much needed mobility, his kit is both varied and fun. With both his Heroic abilities also offering huge amounts of crowd control there’s no doubt Medivh is a powerful Hero that can comfortably sustain any team. 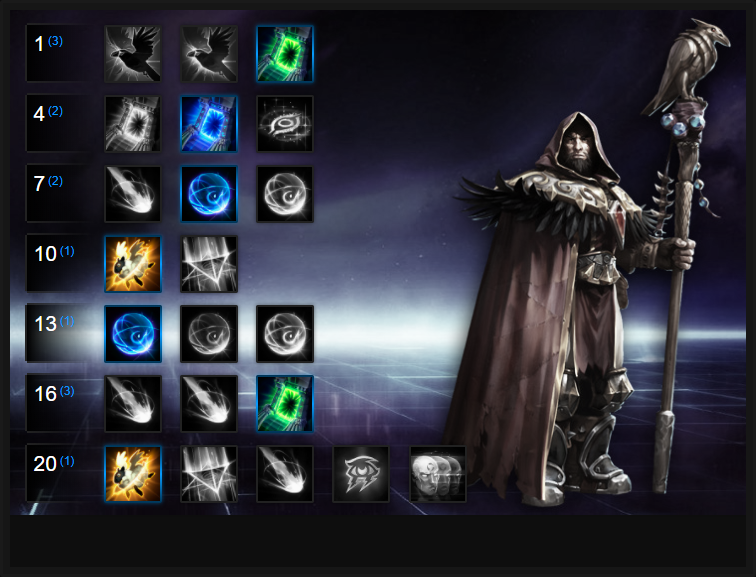 In many respects he fills the role of Tassadar but with a base set of skills that are arguably much stronger. I will stress however that Medivh requires a great deal of skill to play well and often works best alongside a true Support, or a team that has high amounts of sustain. Raven Form (Trait) - Unique to Heroes of the Storm and arguably one of the strongest traits in the game, Raven Form allows Medivh to turn into a bird in order to fly above the map and scout below. While in Raven Form Medivh cannot be harmed, he moves 15% quicker, is immune to all affects and is able to fly over everything. It takes a little over a second to cast Raven Form and it can be interrupted (unlike Rehgar’s Ghost Wolf). Try to always remain in Raven Form prior to any team fight to give your team constant vision to give them a huge advantage over the enemy. Arcane Rift (Q) - A ability that’s deceptively strong, Arcane Rift deals damage to enemies in its path and has its cooldown is reduced by 5 seconds once it hits an enemy Hero, including a refund on half its mana cost (50). As your primary wave clear, it’s important to try to save Arcane Rift for enemies to maximize your damage output and if you can, to always make contact so you maximize its up time. Clever use of your Force of Will combined with landing Arcane Rift ensures Medivh can solo most enemy heroes or at the very least, pressure them a great deal. Ideally, you want to poke repeatedly all game until your quest is complete as it significantly increases the damage of Arcane Rift, while reducing its cooldown. Force of Will (W) - One of the strongest support abilities in the game, Force of Will allows an ally affected to resist ALL damage for 1.5 seconds. On an 8 second cooldown, that’s pretty ridiculous, and works against all Heroic abilities such as Kael’thas’ Pyroblast or Greymane’s Go For The Throat. Be sure to cast it regularly, but also pre-emptively. You want to reduce the damage an individual will take against spike damage, not just basic attacks. Remember that Force of Will is from ALL sources for 1.5 seconds - make it count, as the affected ally is healed for 20% of the amount of the damage absorbed. Portal (E) - Lasting for 6 seconds, Portal provides an interactable gateway that you and your team can use to teleport. The location is fixed and a set distance but the travel is instant. In terms of length, it’s a little longer than Bolt of the Storm and is a guaranteed means of escape. Used offensively however and if Medivh has vision, you can easily teleport your entire team into a fight instantly. As a five man blob, and if you call a target beforehand, few can anticipate the spike. Poly Bomb (Heroic) - An incredibly strong Heroic that lasts until an individual doesn’t “spread” the Poly Bomb to another. Upon impact those affected by Poly Bomb are also silenced for 2 seconds, making fights in close quarters particularly hectic. In objective based maps that require interaction, it can be particularly effective. I will add however that most players know how to cancel Poly Bomb near instantly so unless you cast it in a ridiculously enclosed space, it's limited. Ley Line Seal (Heroic) - Acting similarly to Zeratul’s Void Prison, Ley Line Seal places all enemies caught in its line into stasis for 3 seconds. Those affected are unable to perform any action until it expires. Unsurprisingly, it’s invaluable for allowing a team to reposition before spiking and unlike Void Prison, has a slightly longer range. Fairly mandatory for Medivh, Portal Mastery allows him to choose where he places both portals. For ensuring his entry in and out of combat isn't predictable, this gives Medivh a great deal of control when it comes to initiating or escaping. Providing Medivh and any allies with a Raven when they use his Portal, Raven Familiar will deal damage and slow any enemies nearby who use a basic attack. Considering the Raven familiar can last for 5 seconds, and with multiple allies being able to grab one, it's a high amount of damage and crowd control. Allowing Force of Will to to detonate once it expires, Arcane Explosion causes a minimum of 80 damage, plus a proportion of the damage received (up to 50%). As an AOE attack, and with Force of Will having such a short cooldown, Arcane Explosion offers a solid amount of pressure. On objective based maps that require group fights and very close quarters, Poly Bomb can be good (especially on Infernal Shrines). The fact the enemy team are grouped up so often ensures maximum impact for long periods of time. Circle of Protection is a great Talent against just about any composition. It allows you to cast Barrier of Will on one player, and it will automatically apply to anyone near them. Best of all, this second Force of Will gains all the improvements from your Talents. Although it increases the cooldown of Force of Will by 2 seconds, it's worth it. Reducing the cooldown of Portal by 25% and increasing its duration by 50%, Stable Portal allows Medivh to go in and out of combat repeatedly, without worrying whether he has an escape available or not. It also ensures he can poke, or get his team out alive much easier. Increasing the spread radius of Poly Bomb by 25%, Glyph of Poly Bomb also has the effect detonate 1 second sooner, allowing the chain CC to trigger much quicker. These Hero Threat Levels (1 being lowest threat and 10 being highest threat) are to help you determine which enemy Heroes can give you a headache. For the Heroes listed here, take extra care as they're particularly dangerous for Medivh. Lunara: Her mobility, nuisance poison and vision make life difficult for Medivh. You've no ability to mitigate her damage and although you can Portal away, the poison will last. Tracer: Her speed, Recall, Blink and Ultimate are a constant headache. Force of Will won't protect you long enough and she can quickly Blink after you once you've used Portal. The best you can hope for is to land Poly Bomb or Ley Line Seal. Thrall: His root, ranged poke and self healing are a constant headache in any team fight. If he roots you, you're almost gaurenteed to die once his burst begins. The Butcher: Lamb to the Slaughter can almost gaurentee your death and you'll rarely last long enough to use your Portal to escape. Illidan: His mobility combined with The Hunt can shut you down near instantly. Although your Ultimate can protect you, it won't last long enough unless you dump all your skills instantly. If you don't have them, you're as good as dead. Greymane: As with any caster, you're food for Greymane. Although you can nullify his Ultimate ability, his follow up attacks will finish you very quickly. The best you can hope for is to Portal away. Keep him at a distance! This list of tips and tricks are just a handful of things we think will help your Medivh play. We'll continue to add to the list as required and if you have any tips you'd like to share, let us know in the comments below and we'll place them here. 1. Remember that Medivh is a support Hero, despite being classed as a Specialist. Think of him as a sexxed up Tassadar (sort of!). 2. Constantly use your Raven Form to view where the enemy team are in order to provide vision and prevent those in lane being ganked. 3. Remember that your Raven Form has a cast time but provides total immunity: use it to escape if a fight is going badly. 4. Try to always land your Arcane Rift against an enemy Hero. Its cooldown is fairly long if you don't. 5. Force of Will doesn't have a long cooldown, but you need to ensure it's available in the event the enemy team uses a high damage Ultimate. Be ready to cast it on a team-mate who's being focused. 6. Force of Will nullifys ALL damage for 1.5 seconds and heals for 20% of the damage received. It's unique in its protection and incredibly strong: choose your targets wisely. 7. Outside of your Portal you've absolutely no escapes. As such, positioning is key to being effective and surviving for long periods. Stay on the edges of any fight. 8. Try to always cast Force of Will on high value targets that are being focused. This will trigger your talents that cause it to deal damage and spread to the rest of your team. 9. Try to imagine Ley Line Seal as Zeratul's Void Prison. It works the same way and is primarily used to buy your team time or allow them to reposition. Just be aware that it fires in a straight line so can be difficult to hit multiple enemies with. 10. Be flexible in your Heroic selection. Both are great, with Poly Bomb working best on objective heavy maps that require heavy grouping. 11. If you can, try to use your Portal offensively and cast it from out of the enemies vision. Use bushes and vents as your entry Portal for maximum impact. 12. Arcane Rift is capable of deceptively high damage, especially if you land it against enemy Heroes and reduce its cooldown: 400 damage every 2 seconds isn't too bad. 13. At 20 seconds Portal has a very long cooldown. Considering it also only lasts 6 seconds, once you're commited to a fight there's rarely an escape route (if you've used it to get in! ).